We started at the U.S. National Arboretum, which is so huge you have to drive to different exhibits. 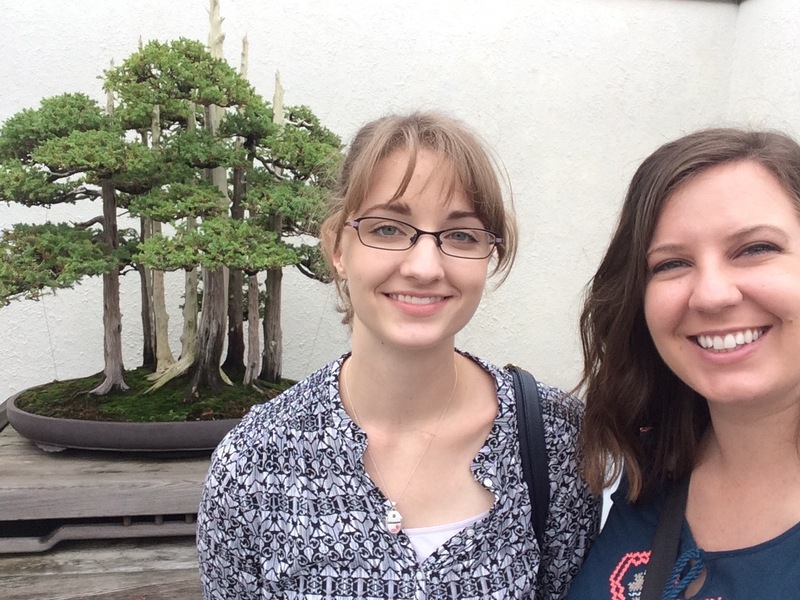 We were there to see the bonsai exhibit, particularly a tree that has been alive since 1625, and survived the nuclear bomb in Hiroshima. The tree’s caretaker later donated the bonsai to the United States in 1976 for our bicentennial in a symbol of goodwill. Walking around the bonsai trees, and listening to an expert describe it as “living art that is begun but never finished” made me much more appreciative of the practice. Plus they are so cute! Goshin, one of the most famous bonsai in the world, tended by John Y. Naka. He added a tree for each of his grandchildren as they were born, eventually totaling eleven juniper bonsai trees. 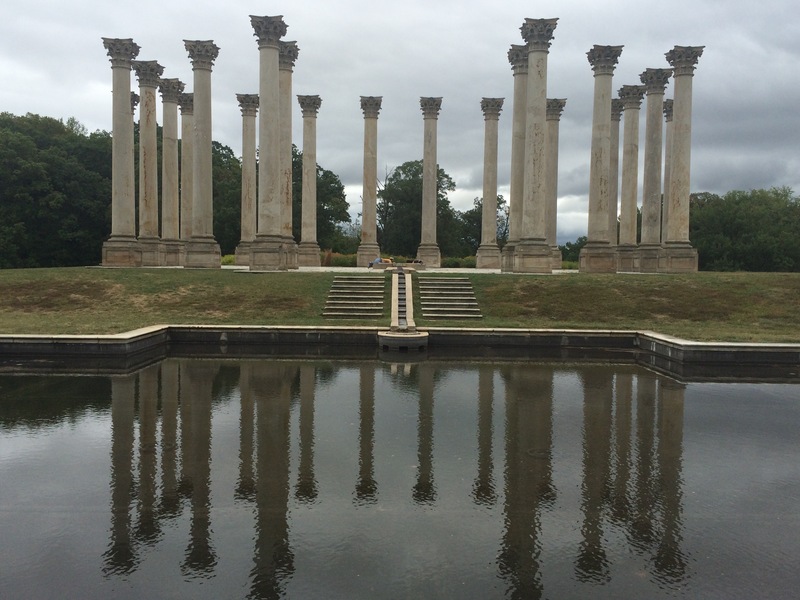 A brief non-Japanese stop at the Arboretum’s Greco-Roman columns, because obviously. They’re actually from the U.S. Capitol, which just shows how much the US culture owes to Greece. Next we drove to Union Station, where we parked our car for the day. We walked out into seemingly drizzly rain, but after half a block realized we were getting soaked. We rushed back to Union Station to buy back-up sweaters at H&M. And to pull my adorably styled hair, now a rainy mess, into a bun. This was very distressing, because DC is known for being fashionable, and somehow everyone else still had great hair. But when we left the building again, the rain had stopped and the wind blew my own shirt dry, so I’m going to return that sweater and get my monies back. 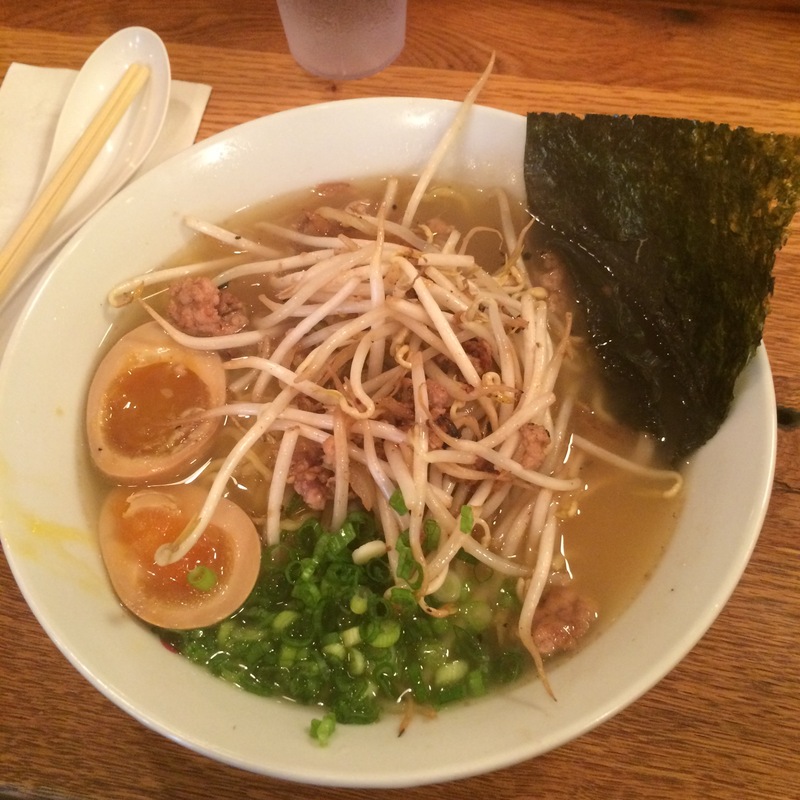 We walked several blocks to Naikaya, a really fantastic ramen shop. I’ve only had the 20 cent American brand and the slightly better fare in Mongolia. I was not prepared for a massive bowl of noodles, egg, meat, and bean sprouts. I tried to perfect eating soup with chopsticks without splattering everyone within ten feet, and I think I mostly succeeded. Japan Day Part 2 was a success! 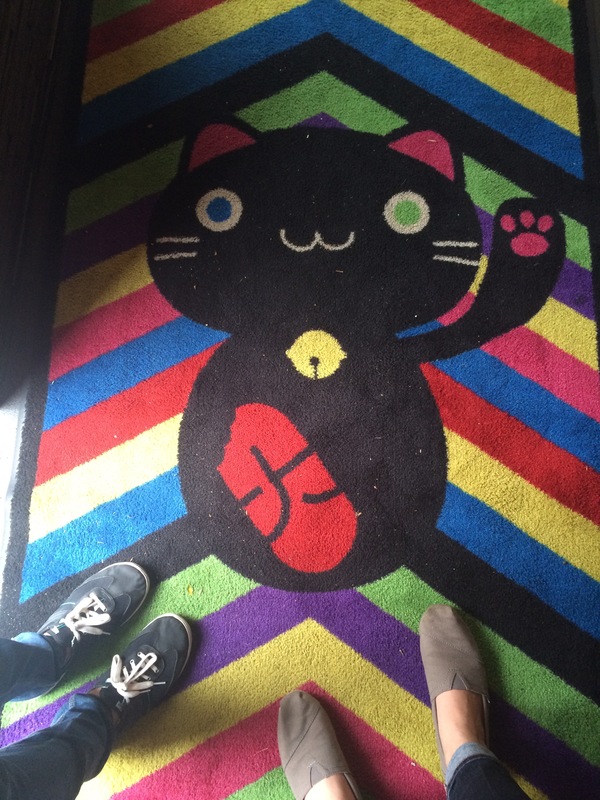 Months ago, I found out that DC has a Japanese-inspired cat cafe, so we caught a DC Circulator to take us to Georgetown. We walked in, and my heart stopped at the adorable sight of ten cats laying around in windows and on chairs. Then the lady at the desk told us that it would be $15 for each of us to spend an hour with the cats, and oh, they didn’t sell coffee anymore, so we could go buy coffee elsewhere and then come back if we wanted. This was not what I had imagined, and we decided not to spend the money. I was heartbroken, but I’ve since decided that I will just save the cat cafe experience for whenever I finally go to Japan. An adorable cat, waving “BYE” to my hopes and dreams. We did seek out coffee, though, at Dean & Deluca. 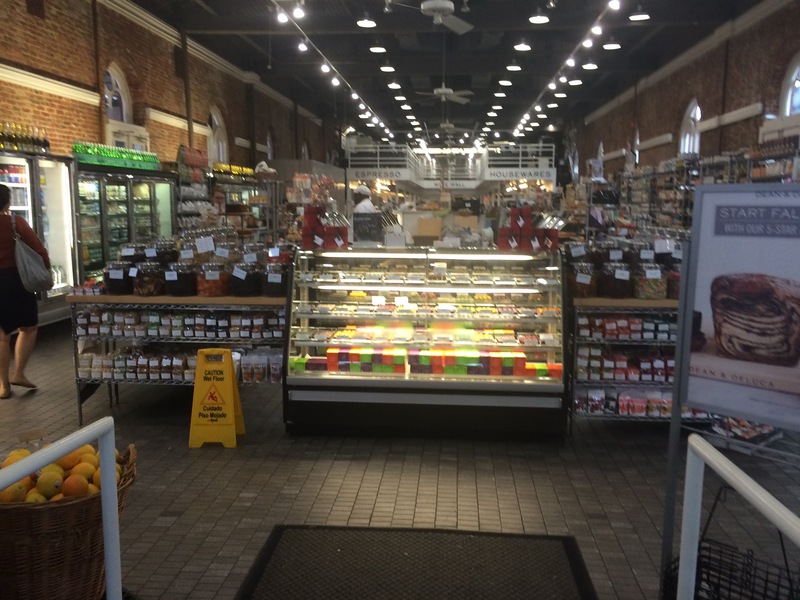 It is the cutest little market that will steal all your money. A package of crackers cost $10. We bought a chocolate and coffee, then sat outside and talked about how being in Georgetown could make us understand people wanting to be lobbyists, if only to be able to afford this lifestyle. I wish I had lots of money, so I could shop here. By then, it was 5:00, and we were supposed to be at the Dirkson Senate Building at 5:45. We caught another DC Circulator, but traffic was horrible, so eventually we got off and walked as fast as possible. We didn’t get there until 6:15, but after walking through security and heading upstairs, we arrived at Sarah Osborn’s office!! It was so fun and bizarre to see her in DC, wearing a pencil skirt and writing very detailed emails to her senator boss. Since it was after 6:00, the Capitol was closed, but Sarah took us downstairs, through the tunnel that connects her building to the Capitol, and led us through another round of underground security. We rode a tiny tram, and bam! 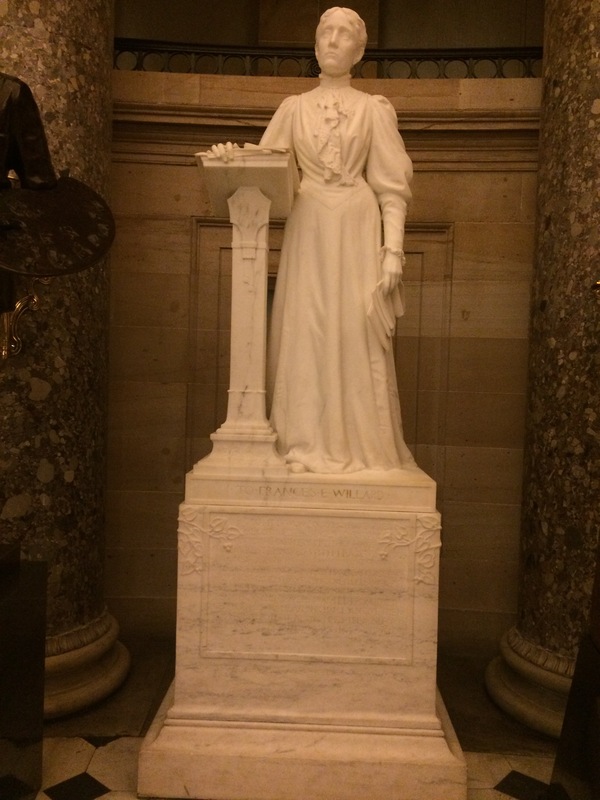 We were having a private, after hours tour of the Capitol! 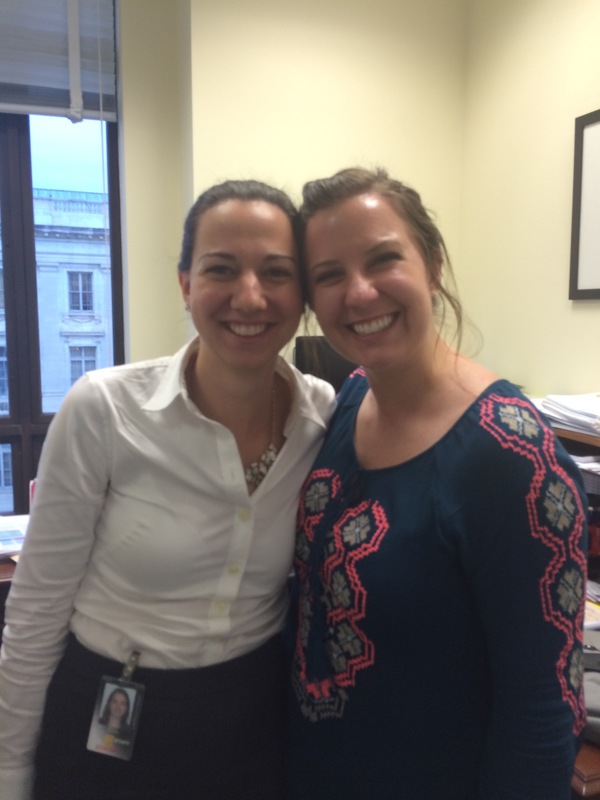 Nine years ago, when she was a baby intern, Sarah had to give tours, so she dredged up ancient knowledge. Here’s a bunch of pictures. 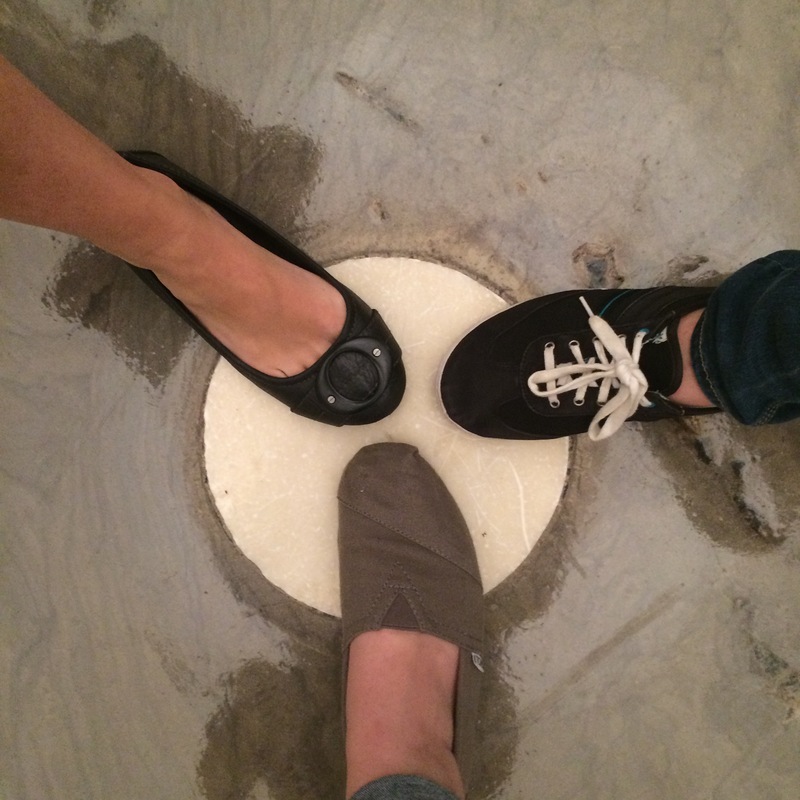 Putting our toesies on the circle that marks the very center of the Capitol, which was originally meant to be the very center of the city of DC. 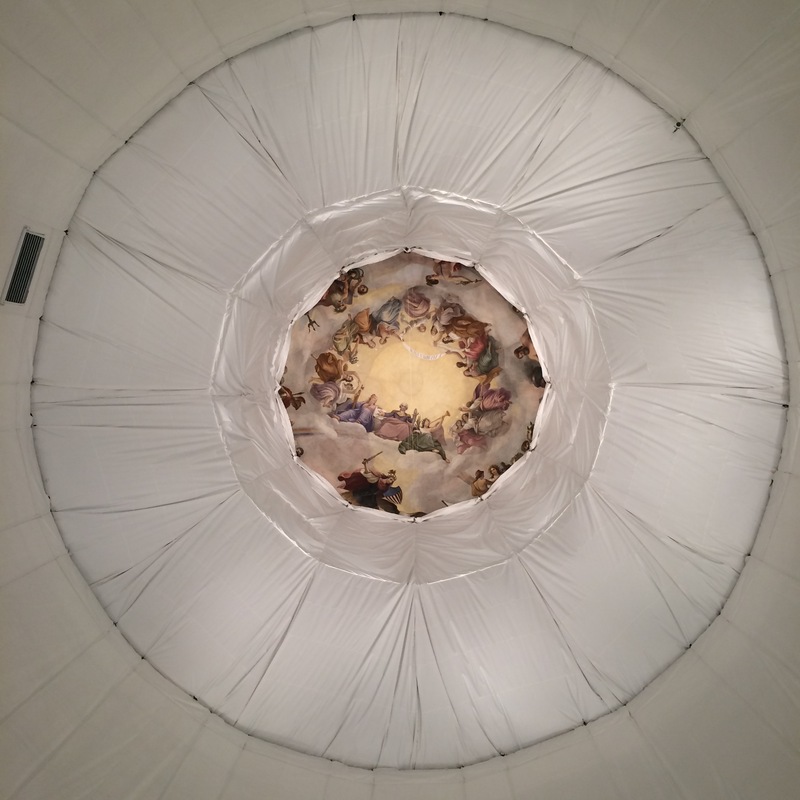 Panorama view of the inside of the dome, unappealingly under construction. The similarly under construction dome. You can just barely see Greek gods-turned-American-values around the outer edge. More Greek influence! 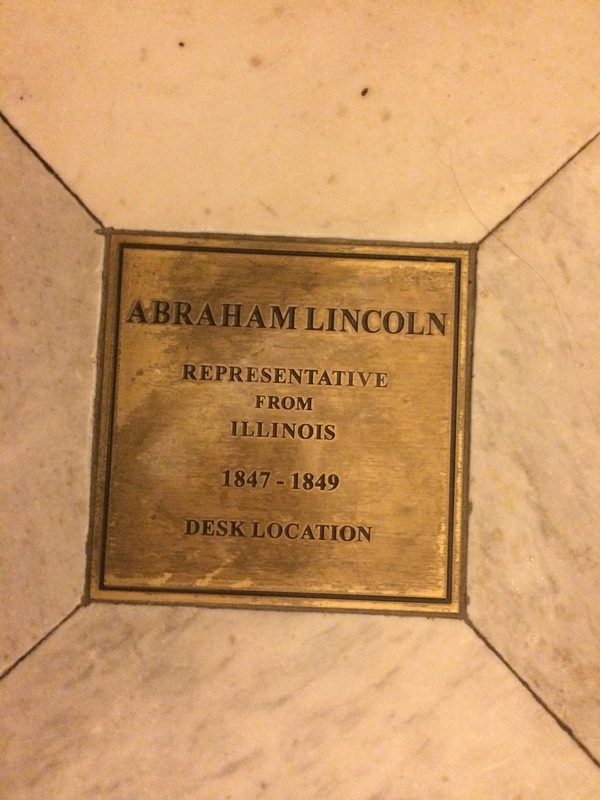 In the old House of Representatives, room: the spot where Abraham Lincoln’s desk used to be! Sarah also demonstrated the whispering effect, and it blew my mind. The extent of my political knowledge is mostly based on Scandal, so I had a lot of fun learning about the less murdery but more realistic drama of the government. Hopefully I will retain something from my crash course in civics. We had dinner reservations at a sushi restaurant, which was delicious. But not totally filling, so we went next door for dessert. We talked and talked, and I was reminded of why Sarah has always been so cool to me. It’s nice to see old friends in new contexts, because you get to appreciate them for different stuff. We parted ways at 10:30, and Elizabeth and I walked back to Union Station. 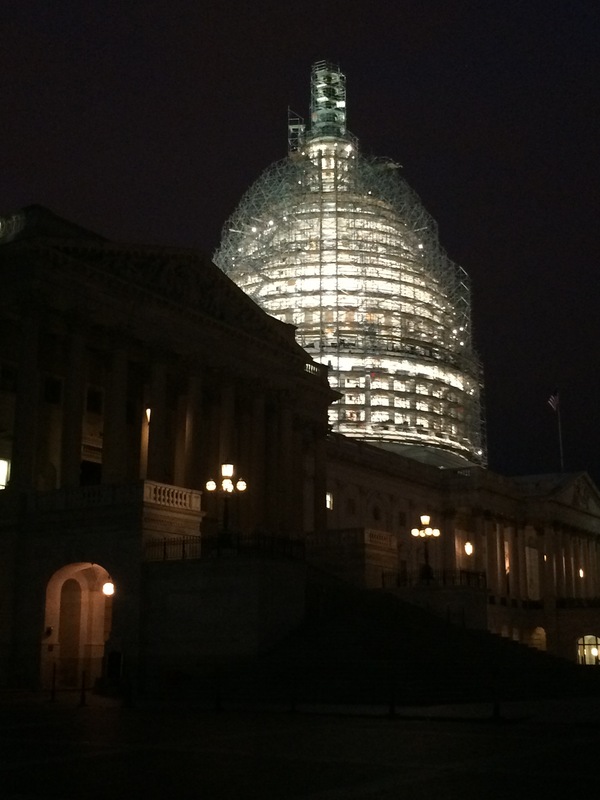 I like to think that the scaffolding surrounding the Capitol’s dome looks like Christmas tinsel. Festive! When we got to the car, Elizabeth realized she didn’t have the keys. With visions of them dropped on the street somewhere dancing through our head, we were relieved to see that they were in the ignition. Unfortunately, we then began the nightmare process of walking ALL OVER Union Station to find a security guard or police officer to help us. There was no one, which did not make me feel safe in the event of a more dangerous emergency. The only people we found was a security guard who told us he worked the train area, not the car area, and some rental car workers who told us to call AAA and then looked at us with judgment when we said we didn’t have AAA. Not very helpful. Added to the panic was the fact that Elizabeth’s phone had died hours ago, and mine had just 21% battery. We called her sister, who rose the situation like a superhero, and drove to Elizabeth’s apartment to get an extra key and then all the way into the city to get it to us. That took another hour, during which we sat inside the desolate Union Station. At 12:30 Natalie and her husband arrived, we got in the car, and all was well. Now that the stress was over, we were able to laugh and have fun again, so we spent the hour-long drive home telling stories. It was 1:30 before we got back to her apartment, which is why I didn’t write last night! It was such a fun day, with such a weird ending, and I’m glad that today is going to be a little more low-key. Next Article New Blog Series: Letters Between Friends!